I hope you all enjoyed your Summer Solstice and are looking forward to the next few beautiful months. In order to keep your needles clicking, and hooks a’ hooking, I will continue to show you some fun, funky and gorgeous things to keep the inspiration flowing. 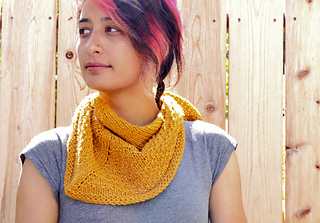 Below, Jane Richmond used HiKoo® Kenzington for her Arika Cowl. 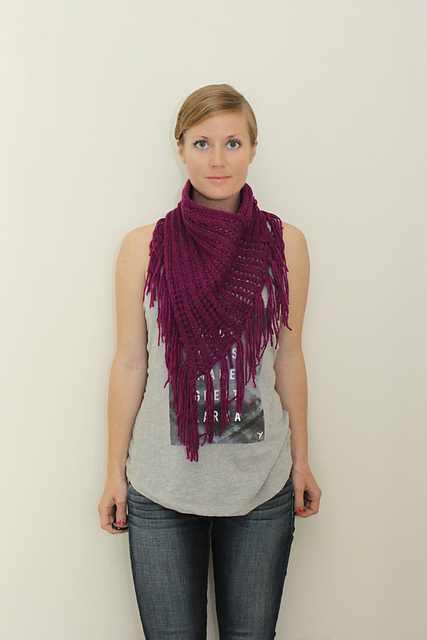 “Clever construction transforms a short scarf into a dynamic cowl. The first half is knit in a cushy 2 x 2 Ribbing creating a double layer of comfort while reducing bulk at the back neck. The second half transitions beautifully to an Eyelet Ribbing. The finished piece is blocked asymmetrically to create the flattering kerchief shape. Fringe is added to the outside border completing the look perfectly. 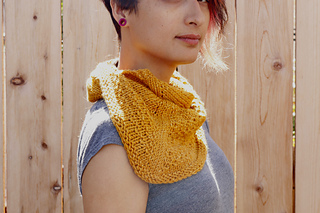 Arika Cowl knit in HiKoo® Kenzington. This week I’ve got a double feature! Two weeks in a row with HiKoo® Simplinatural because I’m seeing beautiful designs pop up everywhere! Please let me introduce you, the Errant Shawl by Fog and String. This is a simple, kercheif style shawlette, starting with a tab cast on, working a section of stockinette then on to a variation on the popular moss stitch. Errant Shawl knit in HiKoo® Simplinatural.